The Big Event lived up to its name with people coming from all over the UK to listen to topics about diabetes for all types (1, 2, etc.) in a single location. It’s an awareness day very similar to the JDRF awareness days (1 and 2), the DRWF Wellness Day and Hedgie Pricks Diabetes awareness day I’ve been to recently. I’m not sure of the exact count but I’d guess there were 500 or 600 people there so it’s a pretty large gathering. One key element of the day for me was to meet some of the wonderful people that I “talk” to through Social Media on a daily basis and for me it was a highlight of my day. The event was in Hammersmith, London, certainly not too far from me therefore easy to get to. Last year’s event was in Warwick so it’s good to Diabetes UK moving the event around each year to enable access for others. Some people though are happy to travel long distances for events like this and I met people who’d come from Nottingham, Derby, Wales and Northern Ireland. Fair play to them. Registration was so simple and within seconds we were into the main hall where I immediately spotted a twitter colleague Dave, or was it Dave? People rarely look like their online presence do they! We’d all joked the other day on Twitter that Dave should bring his Yorkie down to give to whoever spotted him first. I tapped him on the shoulder with a “do you have my Yorkie?”. And so started my series of meetups. Ten minutes later another tweep Rachel came to say hi proving once again that my ‘tweet a picture of today’s t-shirt’ worked. I proudly waved my Yorkie as Rachel was in on the joke too. Then we bumped into friends from our clinic, Steve and Becky, who we’d arranged to meet there. This was already turning out to be a great day, I almost forgot we had talks to attend. Diabetes UK had gathered many talented speakers to discuss various different topics, all organised into tracks, one for Type 1, one for Type 2, one for parents of Type 1 kids and a generic one. You could pick and choose which ones to attend, there was no booking list, just turn up to the right room at the right time. We naturally migrated to the parents/schools sessions. Steve, Becky, Jane and I took our places before I spotted Joe, Diabetes UK’s social media person at the event. We’d spoken online before so I went over for a quick chat. Yet another face to a name ticked off. The talk was given by Libby Dowling, Clinical Advisor for Diabetes UK. She told us about the different policies and tariffs and just what care we should be expecting. The four of us are all at the same clinic and generally we’re pleased with the care we receive but listening others talk about their lack of care we felt quite privileged. The discussions around the room got quite heated as the lack of care provoked emotions. Back in the hall for more coffee and I spotted Simon – who has blogged about The Big Event too – and Teresa and went over for a chat and before I knew it session two was just about to start. It was hard to think we’d not actually met before as it seemed like a meeting between old friends. They introduced me briefly to Laura and Angie, two more from the #DOC. Although Amy has been on a pump for a few months we still felt it was worth attending this session and went along with Steve & Becky whose child is getting a pump quite soon. The talk was hosted by Melissa from INPUTdiabetes and Claire, a Diabetes Specialist Nurse and also co-founder of TeamBloodGlucose, an organisation I’ve been following for a while. 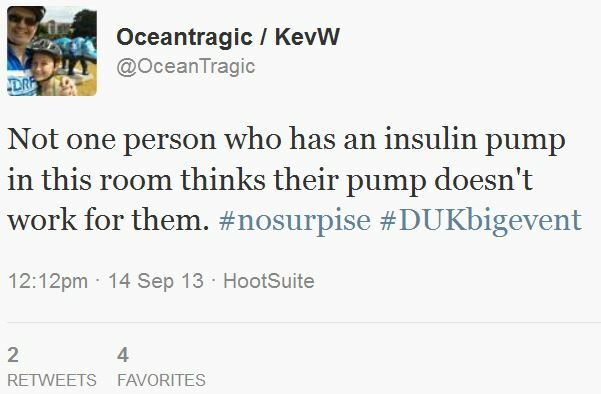 Both have Type 1 Diabetes and are strong advocates for insulin pumps. Questions were asked of the audience: who had a pump? ; who had CGM? ; who loved their pump? ; who didn’t? It didn’t really surprise me that people loved their pumps (however on re-reading my tweet I’m surprised I didn’t spell ‘surprise’ correctly!). It was great to hear Claire and Melissa speak, they were a great double act and everyone wanted Claire’s diabetes awareness dog who stayed near her the whole time. Claire spoke about CGM sensors and forced Melissa to parade uneasily around the audience. Whilst talking about advantages and disadvantages I felt they omitted many of the advantages and bigged up some disadvantages, but I understood that they were probably not wanting to come across as saying pumping is the best solution – there’s a lot of people on daily injections who would get annoyed by that. With the fab presentation over it was question time and some good questions were asked. Someone then started going on about her bad pump experiences and had a go for them bigging up insulin pumps. What a load of rubbish, the pump advantages had clearly been downplayed. I’m sad she had such bad experiences but that doesn’t happen to everyone and I’m sadder that her rant may put people off. Unfortunately it didn’t sound like she was going to stop going on so pretty much the whole audience left. After we’d eaten lunch Karen and her son introduced me to Shaun from Twitter who’d driven a long way for today’s event, yet another meet up done. Then it was time for Amy for change her pump’s insulin/cannula/tube and it seemed to make a lot of sense for her to do it in front of Becky, Karen and their boys, both of which are getting a pump soon. Amy took them through the whole process of drawing the insulin into the cartridge, removing bubbles, fitting the cannula, priming the tube and priming the cannula. I was proud of her for not only doing this in front of people but with the ease she did it under pressure. Karen suggested Amy does a YouTube video of it so perhaps that’s something for the future. This session was also hosted by Claire and Melissa from session 2 and delved deeper into the world of pumps/CGM. Anyone without a pump would have struggled, in fact it’s fair to say that many of us in the room (Jane, me, Teresa, Dave) got a bit lost at points. Carbohydrate counting can be tricky enough but now we were being introduced to Super Bolus and FPUs and multi wave bolusing. Eek! We learned that whilst normal bolusing is fine for normal GI (glycaemic index) foods there was a better method for high GI foods, i.e. those which would cause the blood glucose levels to spike very quickly. Come in Super Bolus to save the day. Roughly you ‘borrow’ some of the forthcoming x hours basal insulin units and add them to the normal food+correction bolus amount, at the same time you put on a temporary basal rate of 0% (or minus 100% depending on your pump) for the x hours. Scott Hanselman’s “Hacking Diabetes” article has a section about Super Bolus which is worth reading. There’s also Super Bolus information on DiabetesNet.com. This was the one that left many in the audience scratching their heads. The idea is that extra insulin is needed for meals high in fat/protein. Roughly you work out the calories from the meal, then work out the calories from fat & protein. With a bit of jiggery and pokery you end up with an amount of units of insulin to cope with the fat & protein, which in turns gives you the time you need to delivery that insulin over. I’ve struggled to find the calculations themselves but DiabetesUK offered to send them to people who were at The Big Event so I hope to receive them soon. Whether or not we start to use them or not only time will tell. Whilst I headed off to this session Jane went to hear the talk about emotional issues surrounding living with Type 1 Diabetes. I’ve heard from many that that session was one of these best of the day. My session was hosted by Libby Dowling who was assisted by a parent of two children with Type 1. 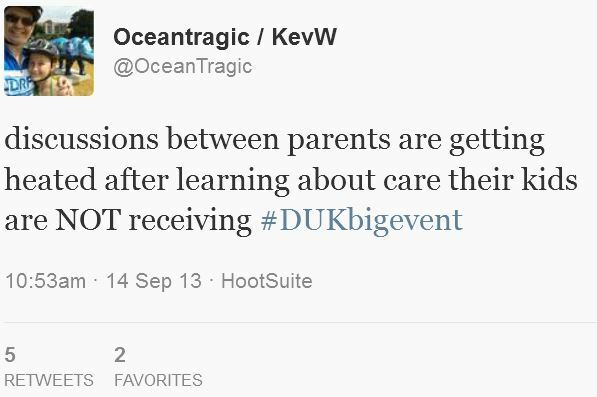 I’d met the parent, Fiona, before at the DRWF Wellness Day back in June. It struck me back then how well educated about diabetes she was, something living with 2 kids with D for many years makes you I guess. Libby spoke about many things to do with children at school, about things Diabetes UK knew about and where they were seeking to go next. Fiona told her story by reading an abridged version of her personal diary. It was quite shocking to hear the problems she had gone through and the prejudice and lack of equality her daughter received at school. Parents spoke about the problems they received, the issues their schools had put them through as I sat in silence grateful for the wonderful school our kids attend. We’ve had no issues that haven’t been immediately rectified once I’d pointed out the errors of their ways. Unbeknown to me, Baroness Barbara Young, Diabetes UK’s Chief Executive was sitting in the audience and stood up to discuss their plans, dealings with organisations and the way forward. I was impressed she took the time to attend a session and ask us what we all thought. The key discussion that everyone agreed with was that someone at each school must be made accountable for any issues surrounding Diabetes (and other similar issues). Furthermore things were unlikely to improve until checks about a school’s equality/inclusion were properly included as part of their Ofsted report. I thought I knew a lot about diabetes but going to an event like this proves I don’t. I learn something at every event and that’s why I will continue to go to every one I can. This event was great, its sessions, its presenters, its organisation and its opportunity for networking. I haven’t really mentioned the childcare where people looked after the kids in a separate room whilst the adults were in sessions. Amy had a great time, playing all the games, drawing and playing with other kids, many of whom had Type 1 too. She’s made a new D friend of her own age and they’ve already started talking to each other online, which is great as we all know how good it is to feel the same as others. The days after the event and we’re all still talking about how much we enjoyed the event so thank you Diabetes UK for organising it. Claire’s dog Magic stayed by her side all day and whilst giving a talk during session 3 he started making a fuss over her. She left the room with Magic. Melissa carried on the talk and it was a while until Claire returned to carry on with her side of the presentation. Claire told us that Magic is trained to recognise a level of 4.5mmol or less. Tagged diabetesuk, events, insulin pump, school, tweetup. Bookmark the permalink. 179,851 hits - how did that happen?